One way to keep a customer a relationship is to monitor the downtime of your customer and call them, within an interval to find out what is going on, on their network. For this to be effective a monitoring device like the mikrotik dude will play a vital role. The Dude network monitor is a software application interface by MikroTik, which can dramatically improve the way; you build your network infrastructure management. It will automatically scan all devices within specified subsets, and allows you to draw a designed map of your networks topology, lets you monitor the performance of your devices and alert you in real time In the case that some devices has problems. In my early days as an intern, I was only giving the Job to monitor customers, up and downtime, and provide a report of customer status, either weekly or monthly depending on the organizational requirements. I was using three network monitoring software applications:the Cacti, Prtg and the Dude. All these software are very perfect for every network, but I found the Dude as a tool giving me real time information on my customers’ status. While all other monitoring devices will have to wait for a refresh period of time, the dude does not. The Dude has the capability to discover any type or brand of device, be it cisco, mikrotik or any other brand of network hard ware. Allows you for easy linking, monitoring and also notifies you, by changing the color of the graph icon you created. Runs in Linux Wine environment, MacOS Darwine, and Windows. 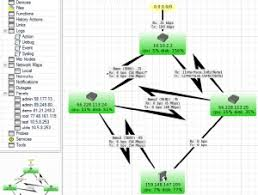 We have outline so much on of the characteristics of the mikrotik Dude now let create a graph using the mikritik Dude. I believe you have downloaded the dude but if you have not please check www.mikrotik.com or click here. Am going to add a device to the mikrotik dude server running on oracle virtual box manager. Left click to add new device on your dude. and the Router Os box also. add a name to identify the client in your network. type should be change d to router then you apply and ok your settings , if this is done properly an icon will appear on your dude server dash board. Now lets link up to two devices together. to link two device together click on the red + sign icon on top left of the dude server, a drop down menu will appear click on link. On the device hold down your right click to draw a map to link to another device, change the mastering type to Router Os, and then lastly you will have to define the type of link your putting up between the two pionts either Vlan, gigabit, point to point, same link as the case may be. then click on finish and your will see your network map. Configuring NTP Server On A Mikrotik Router.